You want her heart to melt at the sound of your poetic words. You want say good morning to her in a way that is unique and shows her how you feel. However, it can be difficult to find the right words. 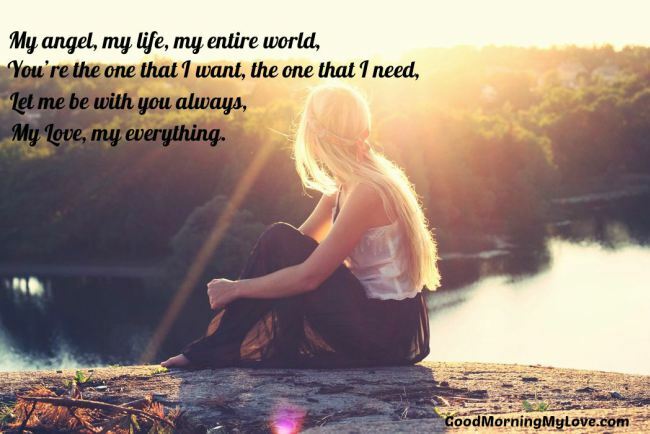 Here you will find romantic good morning poems for her which will help you to communicate what you feel inside. Love poems for her can be some of the most romantic messages for her. 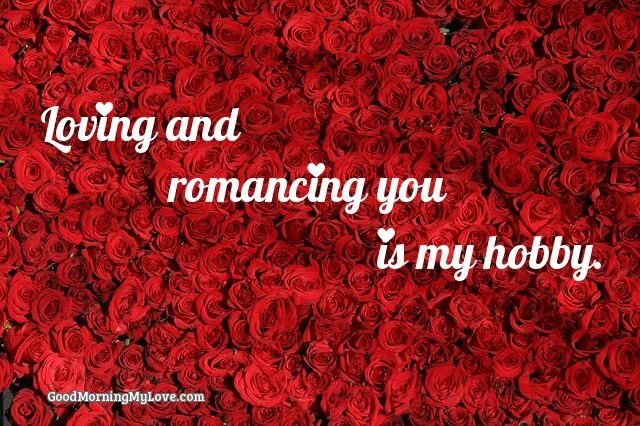 Check out our huge collection of 108 Romantic Love Quotes for Her. Looking instead for non-romantic good morning poems for friends and family? Women adore poetry and love a man who can recite it and use it to touch their innermost desires. Love is an emotion as ancient as time and love poems have been around for centuries, so there is definitely a good morning poem that will perfectly capture what you wish to say to your girlfriend or wife. For a woman, poems are romance and beauty, and to give her a truly good morning beautiful poems are a great way to fill the start of her day with love for you! 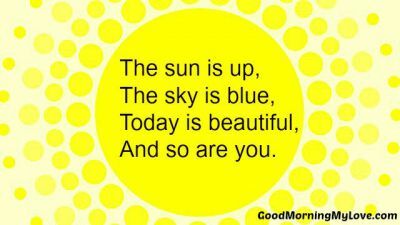 Each of these good morning love poems for her have been carefully chosen as ones which are guaranteed to melt her heart. Whether you’re looking for poems to make her feel special, poems to make her smile or just want to find a poetic way to say “good morning love of my life”, you’ll find the right words here. These good morning poems for her are grouped into short, medium and long. Those without an author’s name are anonymous. You are my destiny, my fate. Check out these girlfriend quotes. Thank you for waking and making my day! It is your heart and your soul that sets me free. Is to draw you near. It is like a dream, that you are mine. My dreams are gone, but you’re my dream come true. Good morning my dear, my breathtaking love. I want to wish you a day full of cheer . Good morning love of my life! So, good morning for today! Fill your day with smile and cheer. And now it’s time for our good monrning kiss. This moment you have made my morning so bright. Watch you lips turn to a smile. When you’re lying warm and near. Try to cheat the break of day. Feels the pressure of my lips. Turns till eyes gaze into mine. I am lost in paradise. I will follow you always no matter the way. And for me that is just fine. The poems in this collection are all intended to be beautiful, romantic and sweet poems for her to wake up to, however many of these could be used any time of the day to express your love and show her how much you care about her and love her. Choosing the perfect I love you poems for her can certainly be a challenge because love is a profound emotion, often tough to capture in words. So, if this collection didn’t help you to completely put words to what you feel in your heart, we’d like to make sure that you are able to do so. We hope you both truly enjoyed these romantic and sweet good morning poems for her to wake up to. You could try reading through our collection of love poems for her to get some more inspiration. Or you could check out this truly awesome collection of cute love poems. These two collections of beautiful poems for her will certainly be more than enough to help you to find the perfect words for your girl. Thank you for visiting us here and we hope you will return often to find more poems for her and continue to make her and your days more special and brimming over with love and emotion! Looking for more cute poems for her? Check out love poems for her. 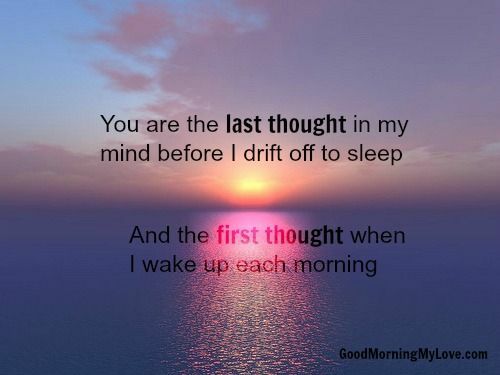 Or looking instead for good morning quotes for her?